Pitcher George Riley is still in life’s game. The world has batted him around since his last days in the majors (1986 Expos). “Thanks so much for asking for my autograph. It makes me feel special. I used to have a 97 mph fastball and a curve that would, what we say, drop off the table. I was pitching in the era that money was not what it is today. As far as my health, last year I had major surgery to remove my entire colon from cancer. So my health is not too good. I was an electrician which I lost. And my house, my dog of 7 yrs. I am living with a friend. It would be highly appreciated if you could help in any way. It’s difficult, very difficult for me and my life. Because I was always very strong. Thanks so much. I contacted the Baseball Assistance Team on the hurler’s behalf. I’m sharing the news with the belief that George Riley wants to sign. He wants to be remembered. He hasn’t demanded a specific fee per signature. 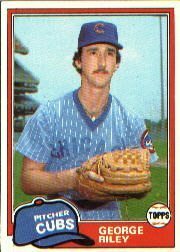 He appears in the 1981 Topps and Donruss sets. Please, send him a donation with your letter. Send him some hope. Coming Friday: Author-illustrator Matt Tavares shares his Red Sox admiration with young readers. Wow, this is a truly touching story. I hope he can find the help he needs.